I believe this is the first appearance of Acorn on this website, background about the company follows. It all started in 1973 when David Quinn from Fayatte, Maine decided to make a Christmas present by stitching leather to a pair of wool socks The goal was comfort and the birth of the slipper sock. For more details from the Acorn website please click here. About The men’s Rambler MOC is available in 3 colors: Chocolate, Olive Tweed, and Olive Plaid. The sizes available are 7, 9, 10, 11, and 12. 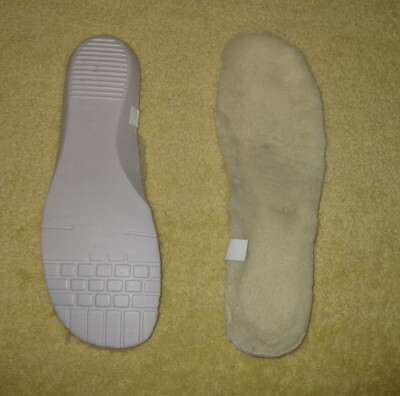 Clean with damp cloth and air dry; brush leather or suede with soft brush to revive. At first glance, I was thinking it looked like an attractive pair of moccasins. The inside reminded me of slippers I had when I was in grammar school. The bottoms of the shoes look like outdoor shoes. When I was a kid I did wear my slippers outside and they got wrecked fast. There no removable footbed. 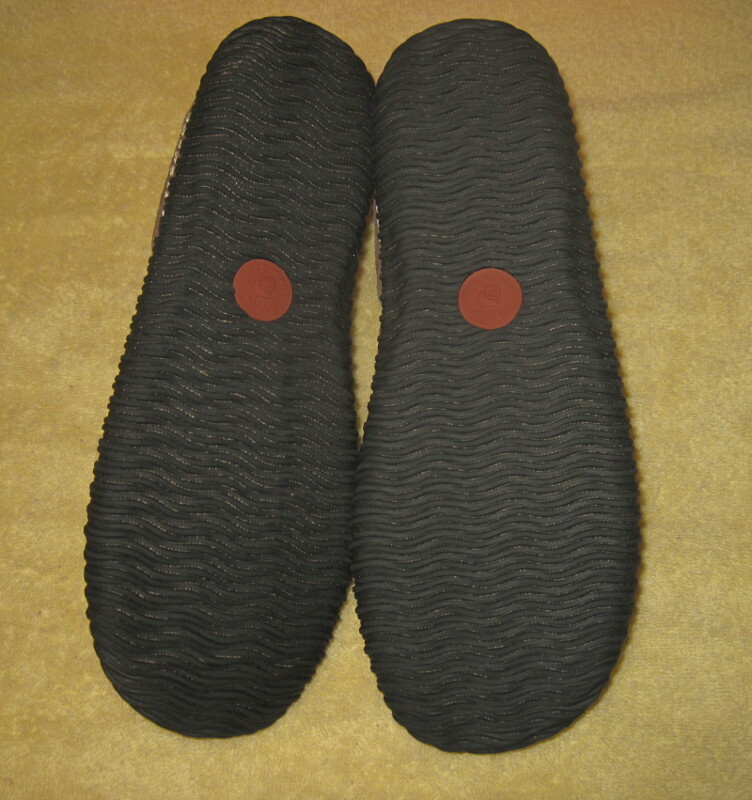 The bottoms were not made for outside and were only fit for walking on clean flat surfaces. I took some quick pictures and had to try them on. I wear footwear without socks and this was not going to be an exception. I found out that the pair of medium wool socks felt too tight for me. I put on a pair of thin wool socks and the fit was snug. Then I tried barefoot and the fit was perfect. 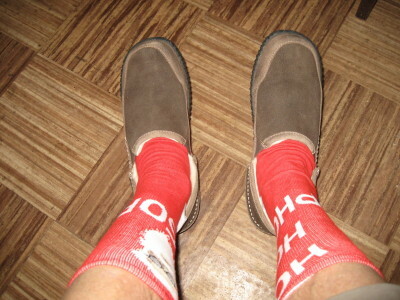 Since I was not going to wear them barefoot I put on a pair of Santa socks I recently received. This fit was snug but not as snug as the thin wool socks. I think with wear the wool will compress and the Rambler MOC shoe feels less snug. I had a couple things to do outside, thus, it was a good time to try these shoes outside. I went to my daughter’s house which is about 300 feet away and then picked up my mail at the end of my driveway. The soles protect my feet from the small irregularities of the pavement and ground. 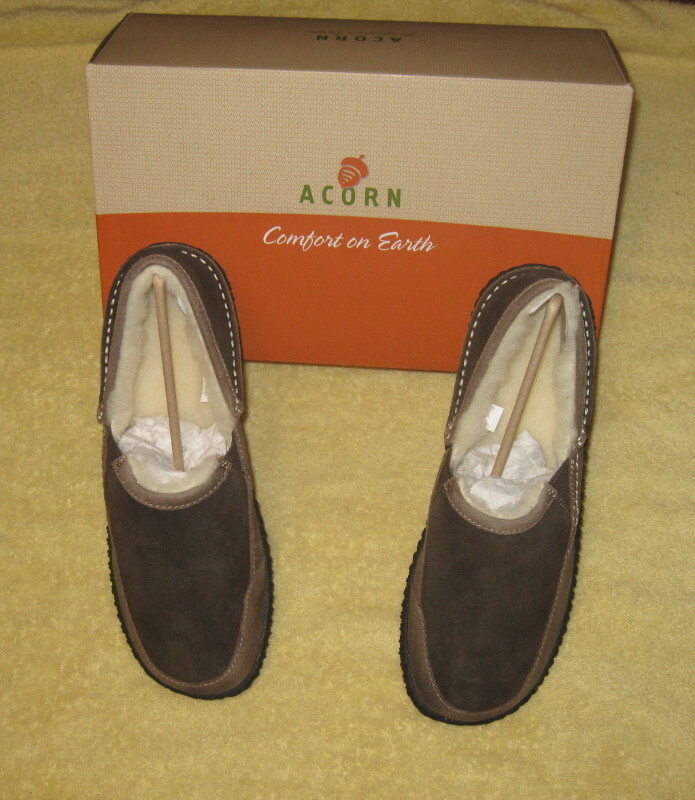 Acorn believes in comfort enough to put the following line below the company name Acorn on the shoe box. “Comfort on Earth.” During the next month, I will be exploring using these shoes in my daily activities. Please check back then for an update. I wish to thank 4alloutdoors.org and Acorn for the opportunity to test the Rambler MOC men’s shoe. Time passes fast when you are in comfort. The Acorn Rambler MOC Men’s shoe is an outdoor/indoor shoe. In a New England winter, I use this shoe outdoors, weather permitting. The majority of the time, I wear these shoes indoors. My feet are the first to notice the temperature variations in my house which result from not running the heat 24/7. These are the areas I will discuss in this report along with pertinent information. The mail arrives after 4 pm and by that time I am in the house and not fond of having to put shoes on to walk to the end of the driveway to get the mail. The Acorn Rambler has worked great in this capacity. I don’t use them during precipitation or if the driveway is wet or icy. There are also trips to the compost when the inside small bucket is full. They are great for short trips even when it is below freezing. I call it the fire even if it is only the flames of my pellet stove. 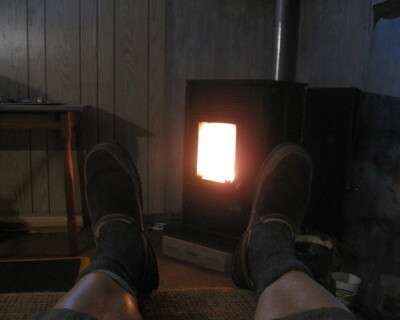 The pellet stove is in the cellar and I have a recliner located several feet from the stove. After coming in from an outdoor activity, I might be feeling cold, tired and weary and I can’t think of anything better than sitting in my recliner in the Acorn Rambler shoes. The stove warms the room, but the concrete floor is still cold. When I am wearing this shoe, I forget that I have a concrete floor. My feet no longer feel cold while sitting at the computer for several hours. Also, I can visit the unheated rooms on the second floor without my feet feeling cold. The only time I wear these shoes without socks is when I wake up during the night to go to the bathroom. Otherwise, I always wear some kind of sock. The only time I now wear cotton socks is with the Rambler shoe which provides warmth and comfort almost equal to the thicker wool socks I usually wear. I have tried my thinnest to my thickest socks in these shoes and all were comfortable, without my getting overheated. Before I got the chance to test the Rambler shoe I was going to dedicate a pair of shoes just for winter use in my house. This shoe has become my cold weather indoor shoe. I would like to thank 4alloutdoors.org and Acorn for the opportunity to test the Acorn Rambler MOC Men’s shoe. Please check back in about a month when I will have more to say. The Acorn Rambler MOC Men’s shoe is now my inside shoe to wear. No more cold spots for my feet in the house. 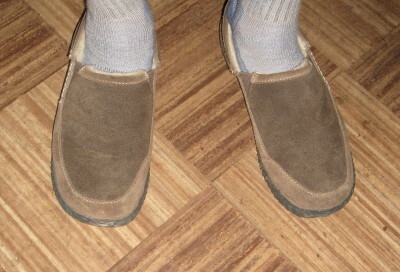 During this period, I have worn these shoes every day in the house and have picked up the mail from the street side mailbox. Weather permitting, I have walked to my daughter’s house about 300 feet away or to the compost in our backyard. I wear socks with these shoes as a personal preference. It did not seem to matter if I wore thin synthetic, thin or medium weight wools socks, my comfort and warmth was the same. We had a couple days when the outside temperature flirted with – 10 F. The unheated room upstairs got down to about 40 F. I did visit that room when it was cold to inspect to make sure nothing was amiss. 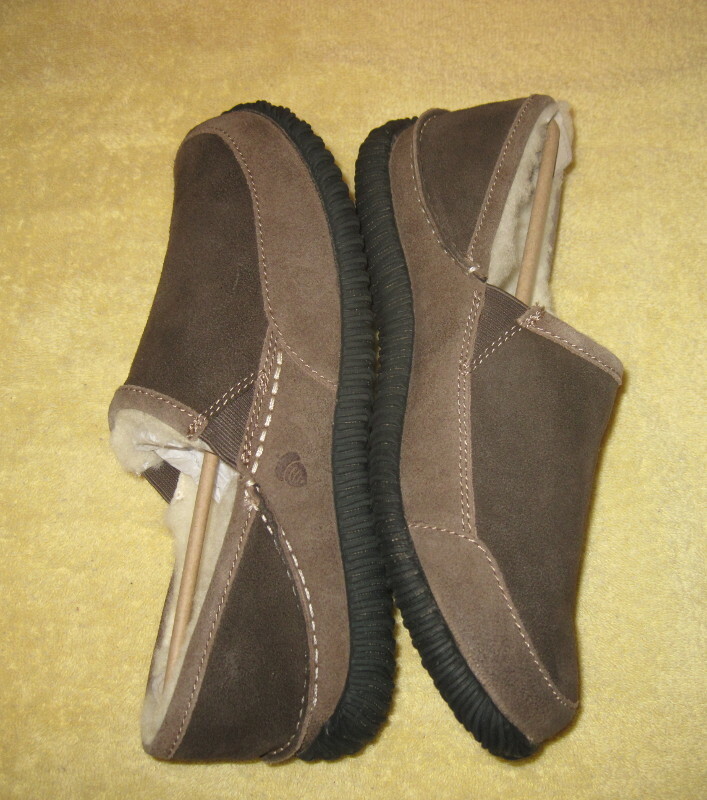 It was not my feet that got cold on these few short trips in the Acorn Rambler MOC Men’s shoe. I have a pellet stove in my cellar. I store the pellets in the back room of the cellar and carry these 40 lb bags to the front room of the cellar at a rate of almost a bag daily. I am able to do this in these shoes without any problem. My toilet tank broke and I replaced the toilet with help. The 80 pounds was too much for me to handle, so I had help carrying the toilet into the house. With help handling the weight, I had no trouble with the outside stairs or going through the double set of doors to get into the house in these shoes. I don’t think I have been as comfortable around the house as I am now. I do spend time in the morning and at night at my computer when the house temperature is lower especially at floor level. My feet have benefited during these times. When I make my semi-annual visit to Mittersill Ski resort I will be taking the Acorn Rambler MOC Men’s shoe with me for indoor use. I have enjoyed wearing these shoes during this test period. The shoes are in great shape. I think they look great after all the use they have had. I wish to thank 4alloutdoors.org and Acorn for the opportunity to test the Rambler MOC Men’s shoe.